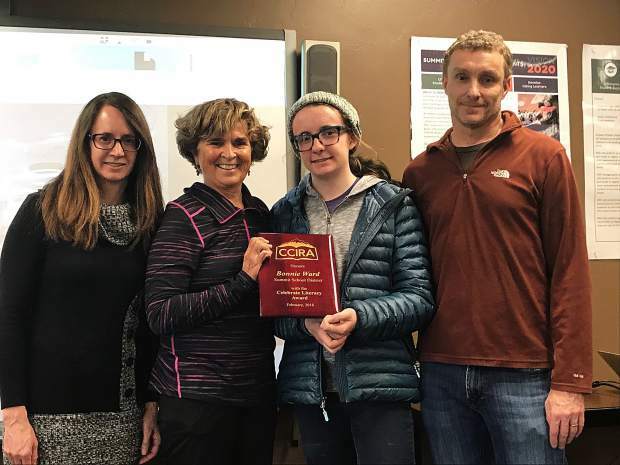 Dr. Bonnie Ward with her family as she receives the "Celebrate Literacy Award" from the Colorado Council International Reading Association at a Summit School District board meeting on March 15, 2018. Summit School District vice president Bonnie Ward has received the prestigious “Celebrate Literacy Award” from the Colorado Council International Reading Association (CCIRA) for her tireless efforts to promote literacy in Summit County. Ward received the Celebrate Literacy Award at a ceremony at the Summit Board of Education meeting on March 15. The stated mission of the award, which comes with a small cash prize, is “to recognize an individual, organization or institution for significant contributions to literacy in a community, state or nation.” Ward received recommendation letters for the award from many members of the education community, including the Summit School District, which stated that the district “can’t imagine a more deserving individual” for the award. Ward’s efforts to promote literacy in Summit have been driven primarily through her work as vice chair for the Eduation Foundation of the Summit, where she has been pivotal in supporting early literacy through successful grant applications and mentoring support. Ward, along with Summit literacy coordinator Hollyanna Bates, also organized a volunteer summer book project which involved 200 volunteer hours to sticker, label and organize books for all six of Summit’s elementary schools. Ward says her efforts to promote literacy in Summit are primarily driven by her desire to give underserved children a chance to experience the wonder of reading.